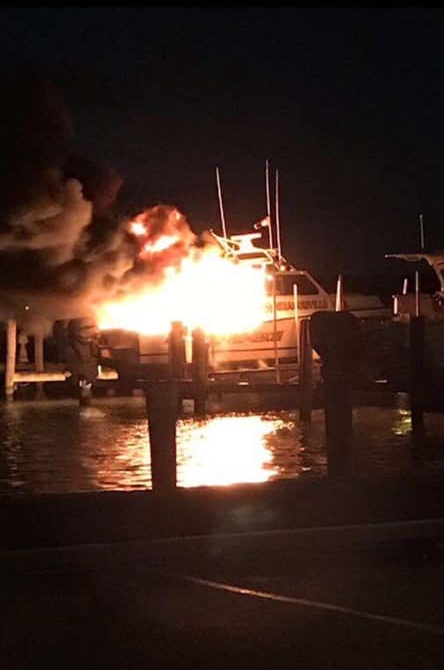 The Grasonville Volunteer Fire Department responded to a boat fire on Kent Narrows Tuesday evening, only to find it was the department’s own Fire Boat 2 going up in flames. The fire department’s command vehicle, Chief 2, arrived at the scene in front of Annie’s Restaurant just after 5:40 p.m. and found visible flames coming from a boat on a boat lift. It was Grasonville VFD’s Fire Boat 2, a 32-foot custom-built Broad Creek Marine. It was built in 2014 with state of the art electronics and a 500 GPM Fire Pump, according to the department. VFD fire crews moved quickly to knock out the fire, but couldn’t stop the fireboat from suffering “severe damage.” No one was injured.